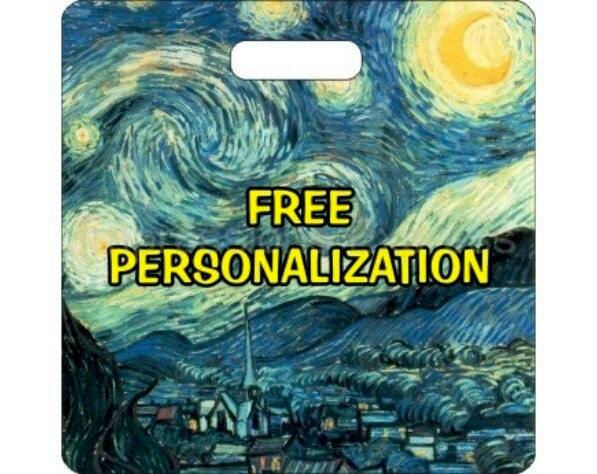 Vincent Van Gogh Starry Night Painting Personalized Square Luggage Bag Tag. A personalized double sided Starry Night design on a square luggage bag tag. The high resolution image is imprinted into a fiberglass reinforced plastic luggage bag tag on BOTH sides and can be personalized with text on one or both sides. This unique 3.5 inch by 3.5 inch bag tag is made of durable 1/16" thick fiberglass reinforced plastic which is easy to clean with a damp cloth. The finish is glossy. The tag comes complete with a 6" rubber loop to attach the tag to a bag. The image on this luggage bag tag is a high resolution image of Vincent Van Gogh's painting called Starry Night. Personalization: Please put the text you would like on the bag tag in the comments section when paying. If there is no text in the comments section we will contact you immediately and request the text. You may also send us a message with the personalization text if you prefer. We must receive the personalization text within 24 hours of payment as we ship within one business day of payment. There is a maximum space for personalization of 5 lines with 10 characters/spaces per line on each side of the tag. This item is non-returnable as it is individually personalized and therefore not re-saleable. Each bag tag is made to order but ships within 1 business day. We do not work on weekends. All orders are usually made within 12 hours of receiving payment on a normal business day.